The Roadmap into Sky Metaphor PowerPoint Template is a guide towards success of complex ideas. The presentation of roadmap metaphor ultimately aids in understanding the optimal path to achieve necessary objectives. Although, the metaphor illustration masks the difficult notions using familiar figures. 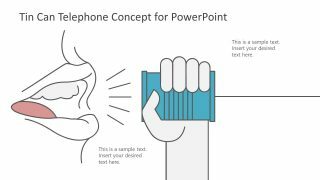 This helps the audience to quickly grasp the underlaying concepts without an effort of going through lengthy documentation. The roadmaps graphically present an enterprise architecture of businesses and timelines. It requires a great deal of planning to reduce the likelihood of failure, allocate resources and map interdependencies. This 4-step roadmap towards the sky seeds several presentation ideas. For example, personal development, future improvements, organizational goals, startup suggestions etc. 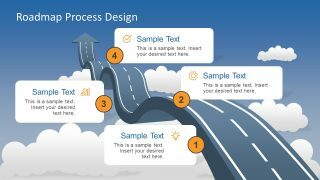 The Roadmap into Sky Metaphor PowerPoint Template slide is a 4-step timeline symbolizing the success. The 3D shape of upwards winding road shows a milestone at every curve. The comment style textbox with numbers appear as milestones. Additionally, the textboxes contain title and description bar, number icons and clipart to relate the subject. 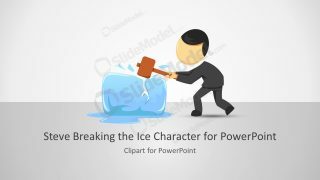 The clipart images include, light bulb for idea, gear for planning, bar chart to manage and correct sign to ensure success. Moreover, the blue background and use of wonderful cloud shapes creates an awesome view of sky. 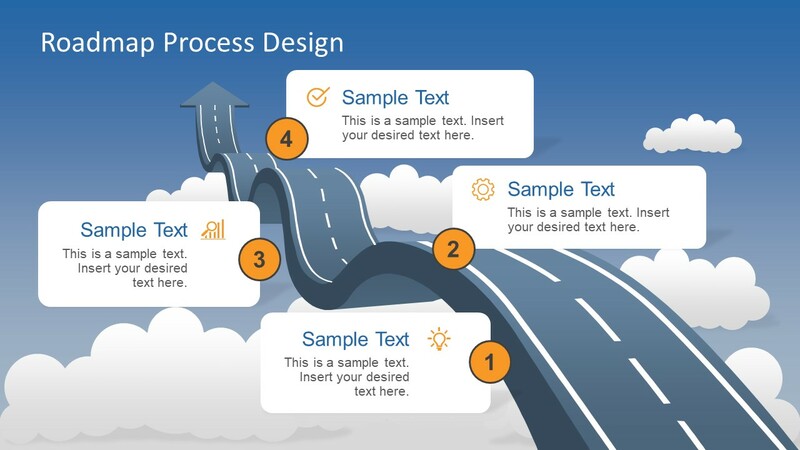 This is 100% editable PowerPoint slide of roadmap and sky shape metaphors. This way, users can change background and object colors and customize theme. Similarly, change the size or move editable items of the template such as cloud shapes. 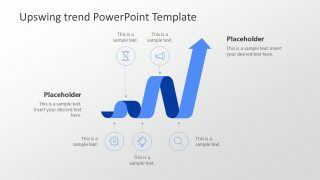 The users can create more slides to emphasize on one milestone at a time by making copies of this slide. 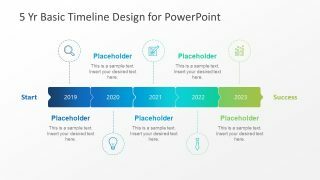 Remove the needless elements to focus on one timeline unit per slide. Every job has its technical details or directions to get from one point to the other. These directions specify milestones leading to desired path e.g. strategic goal of company. The milestones help to stop and analyze tangible requirements and make necessary changes to the plan. On the other hand, students can use this as a strategy presentation for research project. It is also a get tool to create a life goals map using key choices as milestones.